1 edition of Complementary Healing Guide, Denver Metro found in the catalog. Add another edition? 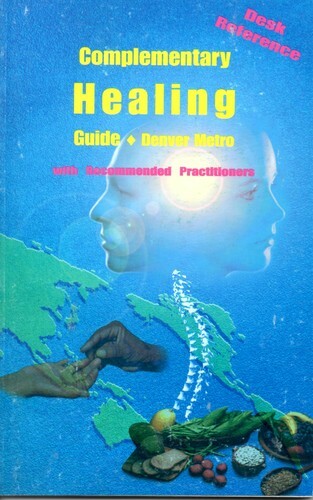 Are you sure you want to remove Complementary Healing Guide, Denver Metro from your list? Published 1998 by Complementary Wellness in Littleton CO .
You are in charge of your own health, and Complementary Healing practitioners are here to help you. Complementary Healing is an inclusive term that recognizes the interaction of many modalities in assisting an individual to healing, and is a holistic approach to healing which integrates with conventional medicine, and does not replace it. There is a strong Complementary Healing movement in Colorado and the rest of the Western World, understanding that Complementary Healing is equally effective as exclusively conventional medicine for the majority of our health conditions, and is usually less expensive. Please join us in this movement. Show others this book and encourage them to learn more about and the use of Complementary Healing modalities for themselves, their families and their organizations. November 17, 2013 Edited by Kenton Johnson Edited without comment.